You never realize how comfortable and privileged your life is until you read stories like this. The fact a child as young as 8 is shedding tears of joy over having a bed (something that most of us take for granted) is heartbreaking. Daeyrs and his mother Dionna are from Detroit. After she lost her job as a trainee nurse, she also lost her house. She and her young son were homeless and spent some time in a shelter. When she was finally granted state-funded housing, the home only had a couple of chairs and a blow-up bed. Daeyrs slept on blankets on the floor. That’s when Humble Design- a non-profit – decided that they were going to fully furnish the house and turn it into a real home that everyone could feel comfortable in. 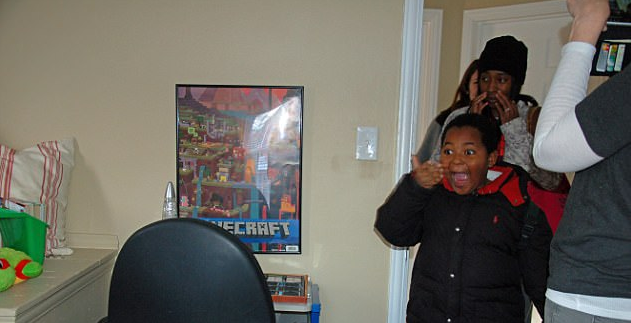 The video shows very clearly how excited the young boy and his mother are to step into their new house. Then, the boy bursts into tears. You see, young Daeyrs wanted one thing for Christmas: A bed. This is enough to break the heart of any parent, especially those who have gone through a period where they couldn’t provide for their children like they deserve. Having been in that situation myself, not having a bed of my own, it is such a big thing and I’m not surprised that he cried. The founder of Humble Design, Treger Strasberg, noted that this particular project made her realize exactly how good she’s had it. “We were referred to Daeyrs and his mother by a social worker, and our first order of business was to ask them exactly what they would like in their house to make it feel like a home,” she explained. “Seeing how much having a bed and his own room meant to Daeyrs, it really made me realize what’s important in life and grateful for everything I have,” she added. There’s nothing like watching an 8-year-old cry tears of joy over a bed to put everything in perspective. This kid is so young and yet he’s been through so much already. It’s good to know that he now has a place to go that makes him happy and feels like home. I sincerely hope this family can get back on their feet and can have an amazing life full of all of the joy that they deserve. God bless this beautiful family.